This week’s staff spotlight is on Legally Blonde‘s choreographer, Dani Shelton. I was lucky enough to get a chance to talk to Dani to ask her about her experiences with Gibson Southern Theatre and Legally Blonde the Musical. 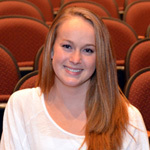 Dani has been involved in Gibson Southern Theatre for eight years now. She has been a part of 17 shows total, including being a cast member in 5 Vaudeville productions, 2 straight plays, which include the state-winning Between Daylight & Booneville where she played the role of Stacy, 5 musicals including portraying Dorothy in The Wizard of Oz, Anita in West Side Story, and Sharpay in High School Musical 2. She also brings the title of assistant director for the past two years of Vaudeville and choreographer for the past three musicals at Gibson Southern along with her.